Sport PERFORMER 2400 Chi Generator - Life Quest® Formulas, Inc. The New Performer 2400 is the ideal Device for fitness training and all sports (individual & team). This is so, because the new SportPerformer 2400 is specifically designed to boost your performance on all levels! Its most important feature is a built-in Frequency Module that has been designed for twelve accurate special pulse settings, each of which can trigger effects that are important for your power performance. Most importantly, it is heavy duty! In fact, with its second built-in generator, it has double the power of other HD devices. Besides the 12-position frequency dial, it has a beamer plate on top, plus a rubbing plate ("stick pad") to generate ideomotor responses, whenever desired. You can increase its power with the PBT 2400 Power Booster with Transfer Disk. One generator can be set at any one of the 12 frequencies with the rotarz switch on top. The second generator runs at a low frequency or you can connect it with an external frequency source, for instance you can effectively quadruple the output by connecting it with one of the outputs of the PCHD 2400, which you can use as an Exterior Precision Module. Like all of our Chi Generators®, the Performer has silver tubing as output: Silver is a favorite of all professionals when it comes to energizing the body. The Performer 2400 has the capability to produce living water the same way as the CE 69, CE 69, the AO 2000, the LPOG 2400 HD, RAD HD's, the ATG 5 and the ATG 12. 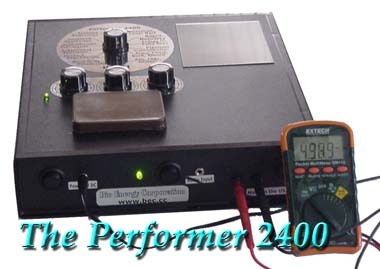 A typical feature of the Performer 2400 and also the PCHD 2400 is the use of frequencies for very specific effects. For you to appreciate the special characteristics of the Performer 2400 Chi Generator® and the PCHD 2400, it is necessary that you understand the principles of low frequency technology. Prior to the invention of the Chi Generator®, perhaps the most important method of effective self-improvement resulted from new knowledge of the working of the human brain. If, on the other hand, you want to determine what level of awareness you want to harness for your success, you can do so by controlling your brain waves. We know of Alpha, Beta, Theta, and Delta brain waves, all in the low frequency range from approx. 1 Hz to 40 Hz (cycles per second). In fact, this method of controlling brain waves with low frequency input is not new at all! In the 1930’s researchers found that repetitive light stimulation caused brain waves to adjust to the same frequency. For decades now, some “new age gurus” and other cult leaders made use of repetitive sound pulses, often of the inaudible and subliminal kind, so that they can cause their captive audiences to be more receptive to their preaching. Much earlier than that, as far back in time at the very dawn of humankind, shamans used drumming (repetitive pulses, or beats, naturally of low frequency) to put their audiences into altered states and cause them to have experiences that they would not have in their normal state of daily activities. In our times, this type of pulse or “beat” is used in many events where the capturing of audiences and the temporary control of their habits (or minds) is important, such as in fashion shows, exercise machine advertising, TV commercials, military training, church, and infomercial pitches to the public, to name just a few. For a long tiome, the Light-Sound device has been the instrument of choice when it comes to causing the brain to adjust to specific frequencies. Therefore, you can find a variety of fairly good Light-Sound (LS) devices on the market today. A LS-device typically stimulates the brain indirectly with light flashes in otherwise blackened goggles and sound stimuli (beats) through earphones. You will always depend on earphones and goggles for any LS-device to be effective. In other words, if you want to access a specific level of awareness such as charismatic appearance, calm, or creativity, you need to get the stimuli through earphones and goggles. It is obvious that you cannot wear these LS-devices when you really need them! And you cannot do creative writing, or art, either while using a LS-device on your head. You need to wait till you can take it off your head, but then your brain waves may adjust back to their usual state. That’s exactly where our Chi Generators® makes a difference – a big one!!! By now it is obvious that the technology of the Chi Generator® is far superior over the conventional type mind machines. This is so, because the Performer 2400 can be set to emit Low Pulse Orgone (Chi energy) in the exact frequency of brain waves: Alpha, Beta, Theta, or Delta. When you are in a field of LPO (Low Pulse Orgone, or Chi), your brain can adjust almost instantly to its frequency, because the detour over sensory perceptions of light and sound or over questionable electric mini-shocks (as in some more recent mind machines) is no longer necessary. Life energy that pulses in brain wave frequencies means faster and reliable results. You achieve the corresponding states of mind almost instantaneously!!! The most striking advantages of your Sport Performer 2400 over conventional type mind machines is the fact that you can project Low Pulse Chi Energy at any distance and that you power yourself up with life force (chi energy) in addition to receiving the precise frequency! Simply use a of structural link such as the transfer disk of the Performer 2400, put it into your pocket, and go to a business meeting, on a date, to the gym, to a sports competition, or anywhere else. There is absolutely no need any more for you to have those cumbersome and ridiculous goggles, earphones, or other contraptions, on your head ever again! You run your Performer 2400 and your EPM 2400 in the desired brain wave frequency and you carry a structural link (transfer disk) on you. You may relax or go about your usual business and go to your fittness- and sports training at any place. With the new Sport Performer 2400 results can be achieved more quicker!